Work had been set to resume in August, but now that’s not going to happen. Officials emphasized, though, that progress is being made elsewhere — tunnel entrances, for example. 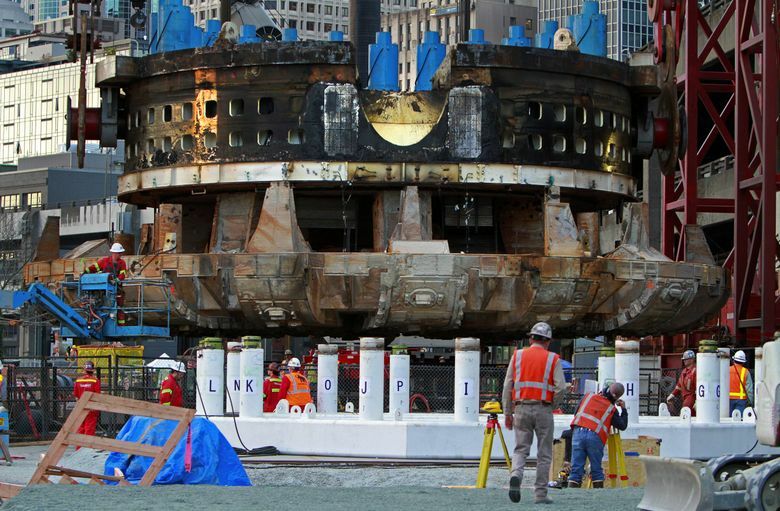 With Bertha’s 2,000-ton cutter head assembly now above ground for repairs, unexpected damage has been found further inside. Now that stalled tunnel machine Bertha’s front end is disassembled, the damage looks worse than project experts thought — and contractors will miss their goal to resume digging in August. Not only did grit penetrate the rubber bearing seals, but the steel casings around the seals broke apart, sending fragments into the drive gears. 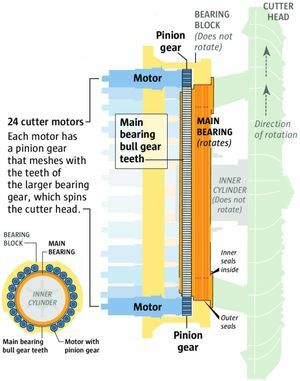 Some teeth are cracked in the giant bull gear, which rotates the circular drill face, as well as several pinion gears that are spun by 24 electric motors. The news was revealed Monday morning by Todd Trepanier, administrator for the state’s Highway 99 replacement project, at a Seattle City Council briefing. Bertha, the world’s biggest tunnel-boring machine, overheated and quit digging on Dec. 6, 2013. The machine is stuck near Pioneer Square, some 1,083 feet into the 9,270-foot route from Sodo to South Lake Union. The highway tunnel has lapsed two years behind schedule, and is now estimated to open in early 2017. Hitachi-Zosen, which built the $80 million, 57-foot-4-inch-diameter machine, is replacing or retrofitting virtually the entire front end. Chris Dixon, project manager for Seattle Tunnel Partners (STP), did acknowledge last winter that his August timeline was aggressive. STP and Hitachi-Zosen wouldn’t comment Monday afternoon. Contractors have blamed the stall on a leftover steel pipe that Bertha hit underground, but the extensive damage suggests the machine may have suffered from inherent weaknesses. Before the giant drill broke down, metal fragments dropped into the pinion gears and the bull gears and the bull gear, cracking and chipping several teeth. (Source: Todd Trepanier, Washington State Department of Transportation. Nonetheless, he said, Hitachi shouldn’t be scapegoated, and he predicted that after Bertha is outfitted with tougher seals and steel stiffening plates, the machine should work. He said gear damage is certainly not common but has happened in tunneling history. While the damage is more extensive, the broken and chipped parts, bull gear included, already were scheduled for replacement. “So that damage they didn’t expect is not causing additional time delay to the repair,” Trepanier told reporters. So in that case, why would STP miss the August goal? Trepanier said that’s a schedule question for contractors, who are supposed to give the Washington State Department of Transportation (WSDOT) a new timeline in June. Contractors have decided to replace not only the outer seals that were known to be damaged but also Bertha’s inner seals “to make them more compatible with the new outer seals, and easier to access should the need arise,” a WSDOT statement said. Those new inner seals are scheduled to arrive in May from Japan. An earlier schedule from Dixon called for finishing repairs and lowering the cutter unit back into the ground by the end of May. They are clearly nowhere near that milestone. Work was under way Monday morning on the rusty cutter face, where openings for dirt to enter will be widened. A WSDOT photo shows contractors smoothing out scuffed surfaces on a drive ring. Council members at the Monday briefing showed growing impatience. In light of Bertha’s woes, Sally Bagshaw, a solid tunnel supporter, wondered how the city knows if Bertha can survive the next 1½ miles of drilling toward South Lake Union. Councilmember Tom Rasmussen raised a formerly taboo question, of whether WSDOT might wind up hiring a new contractor. “Is this open-ended or is there a deadline at some point? Two years, five years or 10 years, something out there?” he asked. Trepanier said WSDOT shares the council’s frustration. He urged members to keep in mind STP is still making progress on every other area of the project, particularly the north and south entrances to the tunnel. Councilmember Mike O’Brien, a former state Sierra Club chairman and early opponent of the tunnel, said he didn’t see changing builders as an option. However, he once again wondered aloud how far the old Alaskan Way Viaduct can sink or crack before it’s retired, for public safety. A few spots have dropped more than 6 inches since the 2001 Nisqually earthquake. State bridge engineers have said previously there’s been little sideways twisting, of the type that can cause a rapid failure of the concrete beams — so the highway remains safe to drive, barring an earthquake. The tunnel was always high-risk because the size and the soil conditions are “beyond precedent,” Boston consultant Thom Neff warned in 2010, in a report for then-Mayor Mike McGinn. Bertha remains under warranty until 1,500 feet, just before it would dive beneath the old viaduct and pass beneath downtown. In addition, Dixon has said Hitachi-Zosen is funding the machine retrofits, while major partners Dragados USA and Tutor-Perini will pay for the deep repair vault. The state continues to provide a monthly cash flow, paying for work on the tunnel’s north and south ends, maintenance building and road deck — but subtracts money based on Bertha’s lack of progress. The state has paid about $1 billion toward the $1.35 billion contract. That doesn’t count overruns, which might take years of talks and lawsuits to settle. Patricia Galloway, chairwoman of the governor’s expert review panel, said Monday she hasn’t yet been briefed, so can’t comment on cost or schedule impacts. The panel is expected to undertake a midyear review. “It’s like any first-of-a-kind technology, or scale-up, that’s going through what you’d call growing pains,” she said. It made sense to her that STP already planned to replace gear parts, before finding damage — other tunnel contractors make similar swaps during an outage, as a preventive measure. In related news, Trepanier also said the soil around Bertha remains stable at about 1¼ inches net loss since November, along the viaduct and in Pioneer Square. Three geotechnical reports were recently finished, he said, two of which suggest that other construction around Pioneer Square has contributed to ground sinking. Satellite-based data show at least seven spots around Yesler Way and Western Avenue lost 3 or 4 inches between 2010 and 2013, before the tunnel project commenced. But the leading culprit remains deep groundwater pumping, related to excavating a 120-foot-deep access vault to reach Bertha, near Main Street at the waterfront. This is due to the very rapid settlement of an inch or more in November 2014. Seattle Public Utilities has torn open Western Avenue to install a temporary water pipe, to replace a cast-iron main that was damaged by soil settling. A new permanent pipe should be installed by fall, said spokesman Andy Ryan. A city-state agreement clearly calls for WSDOT to fund a replacement, yet the state hasn’t agreed to do so, and cost negotiations have just begun.